If a picture is worth a thousand words then I’ll let the picture of 715 describe her structural makeup. I will only add that I think she is structurally flawless. Her heifer calf by 911, making her double bred to 020, will most definitely be a highlight in the heifer replacement pen this fall. Her sire YA Equator 548 is a son of 020. 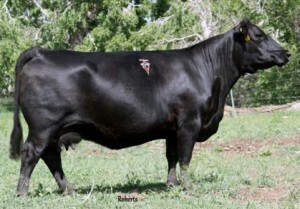 Her dam YA Black Belle Highroller 304 had 13 calves with a NR of 103 and 9 YR @ 101. 304’s maternal granddam, H96 Black Belle 442, is the foundation cow of the famed BLACK BELLE cow family at Yadon’s. Her ET calves by YA Universe 013— also a son of 304–and Vance Top Dawg are due in 2015.